Bhubaneswar:2/11/18: With the 2019 assembly and general elections draw closer, Biju Janata Dal (BJD) supremo and Chief Minister Naveen Patnaik’s voice against the BJP growing louder. A day after saying that the Biju Swasthya Kalyan Yojana is better than Centre’s Ayushman Bharat Yojana, Patnaik on Friday targeted the BJP by reiterating the demand for special category status for Odisha. 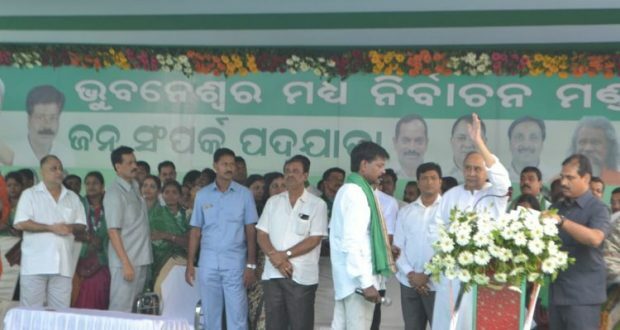 Addressing a meeting during the Jan Sampark Yatra of the BJD at Laxmisagar area of the Capital city, Naveen criticised the Centre saying the BJP forgot its promise for power. “Special category status to Odisha was in the 2014 poll manifesto of BJP. However, the party forgot its promise after coming to power,” he said. “When the BJD and BJP were in the alliance from 2000 to 2009, we had combinedly fought for the special category status to the state. But after splitting the alliance in 2009, we had been fighting for it all alone,” said the Chief Minister. “The ruling party will continue to fight for the special category status for Odisha,” Patnaik said, adding, the people of the state will give a befitting reply to the BJP in the upcoming 2019 elections.